Whether you are Chief Executive, Senior Leader, Business Owner or Business Advisor, using a world-class proven management framework in your business will help you gain a better understanding of your organisation’s strengths, and opportunities for improvement. In turn, this guides your planning and delivery efforts for business success, ensuring alignment throughout your organisation. We call this approach “Performance Excellence”. Using a Performance Excellence approach has assisted thousands of organisations around the world for more than thirty years. Taking a Performance Excellence approach is not something extra, it’s designed to be integrated into what you already do or should do. It gives you a road-map for your activities, helps you set your priorities and ensures your efforts are taking your organisation forward towards your vision. By Adopting a performance excellence framework! There are a range of these throughout the world including EFQM in Europe, and Business Excellence Australia. NZBEF supports all globally recognised business excellence frameworks, and since its beginning has used the the Baldrige Criteria for Performance Excellence from the USA, as it is an internationally calibrated, proven framework which is reviewed by business leaders every two years. The Baldrige Framework reflects all the characteristics of leading international organisations. The fact that it is generic, holistic and non-prescriptive, allows other business improvement tools to work in harmony with these Criteria, acting as an overarching guide for continuous business performance improvement. The Criteria don’t tell you which processes to use, they identify whether you have a process in the first place. Since 1993 the NZBEF have been able to provide real New Zealand examples of success in applying the Criteria using tools such as ISO, LEAN, Six Sigma, and the Balance Scorecard as well as sector audit tools to address specific and near-sighted business needs. A key strength of the Criteria is the alignment between the various benefits to an organisation and getting results. This is an area that many organisations struggle to address effectively, potentially compromising their efforts. 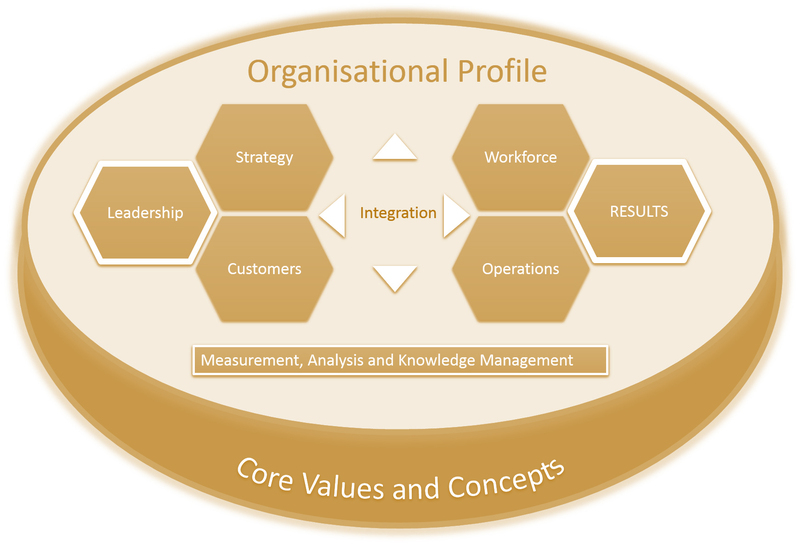 The framework is reflective of key business functions found in any organisation. All the functions interact and align with one another in “cause and effect”, which is the key to gaining total continuous performance excellence. What are the criteria for Performance Excellence? Is your organisation doing as well as it could? What and how should your organisation improve or change? How do your senior leaders lead the organisation, and how do you govern your organisation and fulfil your societal responsibilities? How do you develop and implement your strategy? How do you obtain information from your customers and how do you engage customers by serving their needs and building relationships? How do you measure, analyse and then improve organisational performance, and how do you manage your organisational knowledge assets, information and information technology infrastructure? How do you build an effective and supportive workforce environment, and how do you engage your workforce to acheive a high performance work environment? How do you design, manage and improve your key products and work processes, and how do you ensure effective management of your operations? What are the results for each of the categories above – or, how do you know what you say you are doing, is working? The connections between your processes and the results you achieve. The need for data in the strategic planning process and for improvingS operations. The connection between workforce planning and strategic planning. The need for customer and market knowledge in establishing your strategy and action plans. The connection between your action plans and any changes needed in your operations. No matter your organisation’s size, sector or industry we can support you on your business improvement journey. Our approach is built on the validated and internationally renowned Criteria for Performance Excellence Framework.